The cover photo, then, shows the Beatles assuming this new identity and laying to rest their earlier image as the Fab Four. People looking for clues of Paul’s death, however, interpreted the cover of Sgt. Pepper as representing Paul’s burial and the end of the Beatles as we had known them. With its iconic cover featuring so many images from popular culture, Sgt. Pepper is rife with “Paul is dead” clues. The new psychedelic Beatles stand at the center while wax images of the younger Beatles look mournfully on the gravesite because the Beatles were no longer the same band. Looking at the older, psychedelic Beatles, you’ll notice a couple of odd things. While the rest of the Beatles are standing at an angle, Paul is facing the camera as though he were being supported by his bandmates standing at his sides. While the rest of the Beatles are holding brass band instruments, Paul’s cor anglaise is black (death) and wooden (coffin). A hand is over Paul’s head, as though he were being blessed by a priest before being interred. In Strawberry Fields Forever #51, Joel Glazier points out that this hand belongs to Stephen Crane, who wrote a short story called “The Open Boat” based on his experience of surviving a shipwreck. He and three other men made it to a lifeboat, but one of the men drowned when the boat capsized. In his fictionalized version of the story, though Billie (the only character referred to by name) is the strongest of the four men in the boat, he drowns when they try to swim to shore. Glazier also notes that Stephen Crane died in his 20s, and a number of the other figures depicted on the cover died tragic deaths, as well, including Jayne Mansfield who was decapitated in a car crash. Across the gravesite is a bass guitar oriented the way Paul, who was left-handed, would play it. The strings of the instrument are made of sticks but there are only three sticks rather than four, just as there would only be three Beatles without Paul. With a little imagination you can see that the yellow hyacinths spell out “PAUL?” or, looked at another way, the flowers form the letter “P”. Joel Glazier points t o perhaps the most imaginative interpretation of an image on the cover of Sgt. Pepper. If you hold a mirror across the middle of the words “LONELY HEARTS” written across the center of the bass drum, you will see “IONEIX HE<>DIE”. When arranged as “I ONE IX HE <> DIE,” this image suggests the date (11-9, or November 9, 1966) that Paul died, as the diamond between the words “HE” and “DIE” points directly at Paul. One problem with this interpretation is that the British write dates as day-month-year rather than the American month-day-year, which would make this date September 11th rather than November 9th. You could read this, then, as “1 ONE 1 X”, meaning that one of the four is gone, and then the “HE DIE” points to Paul as the missing Beatle. 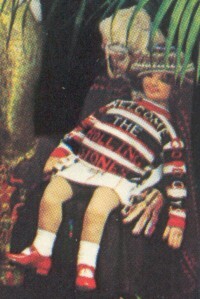 The doll at the right side of the picture–the cloth figure of Shirley Temple–wears a sweater that reads “WELCOME THE ROLLING STONES”. Joel Glazier asserts that the Rolling Stones helped to cover up Paul’s death and the reference on the cover was a thank you from the Beatles. This message also suggests that without the Beatles the Rolling Stones would have been the undisputed leading rock and roll band. A model of an Aston-Martin, the type of car that Paul was supposedly driving at the time of his fatal accident, is leaned against the doll’s leg. The interior of the car is red, symbolizing Paul’s bloody accident. Also, the cloth grandmother figure, on whose lap the Shirley Temple doll is resting, is wearing a blood stained driving glove. The Japanese stone figure at the feet of the wax images of the younger Beatles has line on its head, representing the head wounds that Paul sustained in his fatal accident. The four-armed Indian doll at the front of the picture is Shiva, symbol of both destruction and creation. Two of the doll’s arms are raised, one pointing at the wax image of the younger Paul and the other pointing at Paul himself. The television set on the ground to the right of the Beatles is turned off, suggesting that the news of the tragedy had been suppressed. The album cover of Sgt. Pepper’s Lonely Hearts Club band was innovative in several ways. 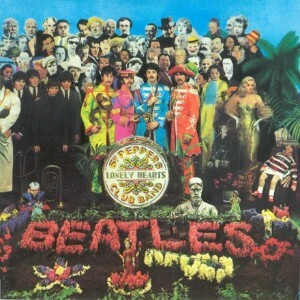 It was one of the first to feature a gatefold sleeve, which allowed the Beatles an especially large space for a band photo. In the photo Paul is wearing a patch with the letters “O.P.D.”, interpreted as “Officially Pronounced Dead.” In his article in Life magazine, John Neary reported that this phrase is the equivalent of “Dead On Arrival” in British police jargon. In the same Life magazine article Paul stated, “It is all bloody stupid. I picked up the O.P.D. badge in Canada. It was a police badge. Perhaps it means Ontario Police Department or something.” This explanation didn’t help to clarify anything, however, because there is no such thing is the Ontario Police Department (well, except in California, that is). 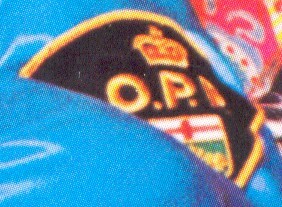 The badge Paul was wearing actually reads “O.P.P.”, which stands for the Ontario Provincial Police. The angle of the photograph makes the final “P” look like a “D”. Another distinguishing feature of Sgt. 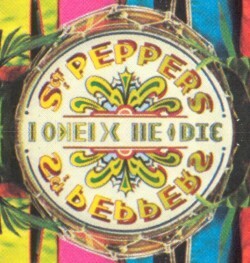 Pepper was that it was the first album to have the song lyrics printed in full on the album cover. On the original LP the song lyrics are printed on the back cover over a picture of the Beatles. Unlike the rest of the Beatles, Paul has his back turned to the camera, the three black buttons on the back of his coat representing the mourning of the other Beatles. Though John, Paul and George were all about the same height, Paul appears taller than the other Beatles, suggesting that he is ascending. 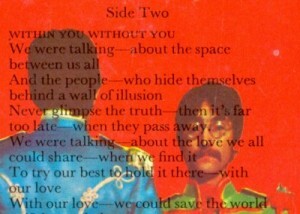 Next to Paul’s head are the words “WITHOUT YOU” from the song title “Within You Without You”. Also, George appears to be pointing at the words “Wednesday morning at five o’clock as the day begins”, which was supposed to have been the time of Paul’s fatal accident. George positioned his hand in this way not to point to the printed lyrics, but to make the letter “L”, the first letter in the word “LOVE”, as the Beatles appea r to be spelling out the word “LOVE” with their hands. In addition to George pointing his fingers in the shape of an “L”, John’s hands are arranged in a “V” shape, and Ringo’s clasped hands form an “E”. The “O” is missing as Paul’s hands are not visible. On the album “Sgt. 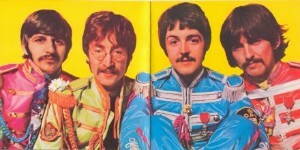 Pepper’s Lonely Hearts Club Band,” one of the songs, “A Day in the Life,” has been interpreted as Paul’s official death announcement. In the lyric of the song is the phrase: He blew his mind out in a car. This is to support the theory that Paul did die in an automobile accident in November, 1966-more precisely, that he was decapitated. Posted on August 6, 2013 April 7, 2014 by Dead Man	in Paul Is Dead. Tags: Beatles, Paul is dead, Sgt. Pepper.